A few recent papers, [Enright, Marschner & Fedkiw 2002; Foster & Fedkiw 2001; Foster & Metaxas 1996], have described the development of a computational fluid dynamics simulation method useful for computer graphics. We have implemented a system based on these papers, and propose an extension that augments and simplifies the handling of occlusions (impermeable solid objects). In the referenced papers, occlusions are treated differently based on whether or not they are moving, and discussion of how to deal with complex occlusions efficiently is minimal. The technique we have developed unifies the treatment of static and dynamic objects, and is able to better represent fluid-occlusion interactions at the low simulation resolutions used. Our contribution consists of two parts. The first part involves representing the occlusions via an augmented level set instead of the usual polygon based representations. The second aspect of our contribution consists of a technique called constrained velocity extrapolation, which uses the occlusions level set representation to better capture the subtle effects the occlusions have on the behavior of surrounding fluid. In addition to just more accurate fluid-occlusion interactions the above techniques allow for our arbitrarily shaped, moving occlusions (such as the two cups above) to act as containers for the fluid. 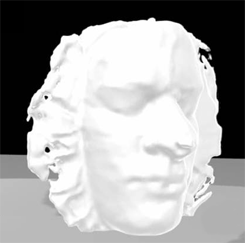 Fluid velocities around occlusions resulting from standard voxelization of occlusions. More information available on the ACM Digital Library page for this sketch. This research was supported in part by NRC IRAP Grant #482564.